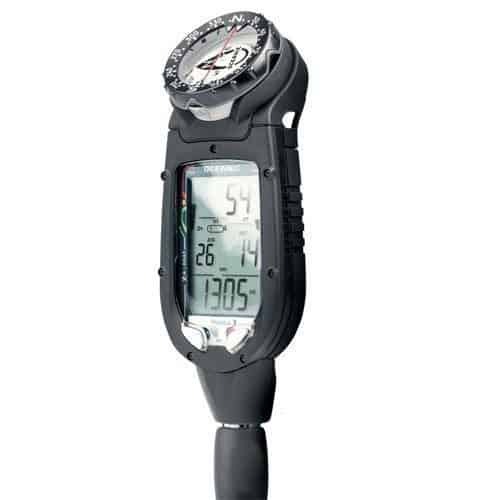 ​The Suunto Cobra 3 is designed for new recreational divers who would like to combine their pressure gauge and their dive computer into one piece of equipment. This is not a typical wrist mounted computer and can be great for those looking for a gauge design dive computer. 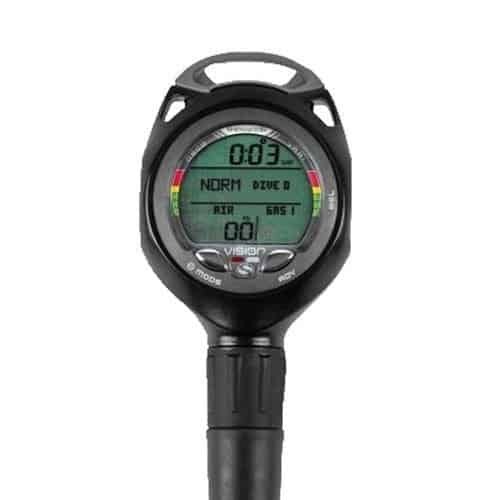 This diving computer is not designed for professional divers and does not have many of the technical features that would be needed on more advanced dives. This basic diving computer is ideal for new divers who want something that is simple to use but still offers some room to grow. The Suunto Cobra 3 does offer room to grow with things like nitrox and dual gas mixtures. So, even if it is the first dive computer you purchase, you should have it for quite some time. ​The Suunto Cobra 3 gets a lower price point score simply because it is a gauge style computer. The Suunto Cobra 3 is a great beginner dive computer because of the integrated features. The audio and visual alarms allow new divers to be aware of vital diving data without overwhelming them with too much technical data. Air integration means that you do not need an additional air gauge to monitor your air pressure, leaving you with fewer hoses to get tangled in or drag across the coral. The two-button navigation is good in theory, but the long and short hold design of navigation leaves a little to be desired. It is easy to get frustrated when navigating to the screen or programming features that you want for the computer. The compass design on the computer isn’t the best. You do not get a full compass mode and are only able to see your locked bearing through a series of small graphics on the computer. It can be easy to forget what the graphics mean, making it even easier to lose your bearing. Finally, while there are adjustable gas mixes and great altitude adjustments available in the Suunto Cobra 3, there is no automatic altitude adjustment. This could be dangerous for newer divers who may not fully understand the impact altitude has on their diving capabilities. The Suunto Cobra 3 is an easy to use scuba computer console with two navigation buttons. The three line display makes for easy reading, even though it may be a little bit crowded. It attaches through hoses and is not worn on your wrist. You can have air integration through a high-pressure hose on your regulator. The navigation happens through two buttons. Each button has two functions that are accessed through either a short press or a long press. This can be a little frustrating if you’re not used to this style of navigation on the computer. The price for a wrist computer and a pressure gauge together would be equal to or even less than this computer. There are other options at this price point that have better design features. The Suunto Cobra 3 targets the beginner and intermediate diver. If you are an experienced or technical diver and you want all the bells and whistles then this is not the best choice for you! There are two gas mixes allowed with the Suunto Cobra 3, and the oxygen rates can be from 21%-99%. Nitrox works well with the Cobra 3 and divers with their nitrox certification will not be disappointed when they have this computer to dive with. The Suunto Cobra 3 has a slightly different air integration than other dive computers. It integrates through a high-pressure hose connection onto your regulator. Many other diving computers will use a wireless node to send data to the computer to integrate air pressure data. 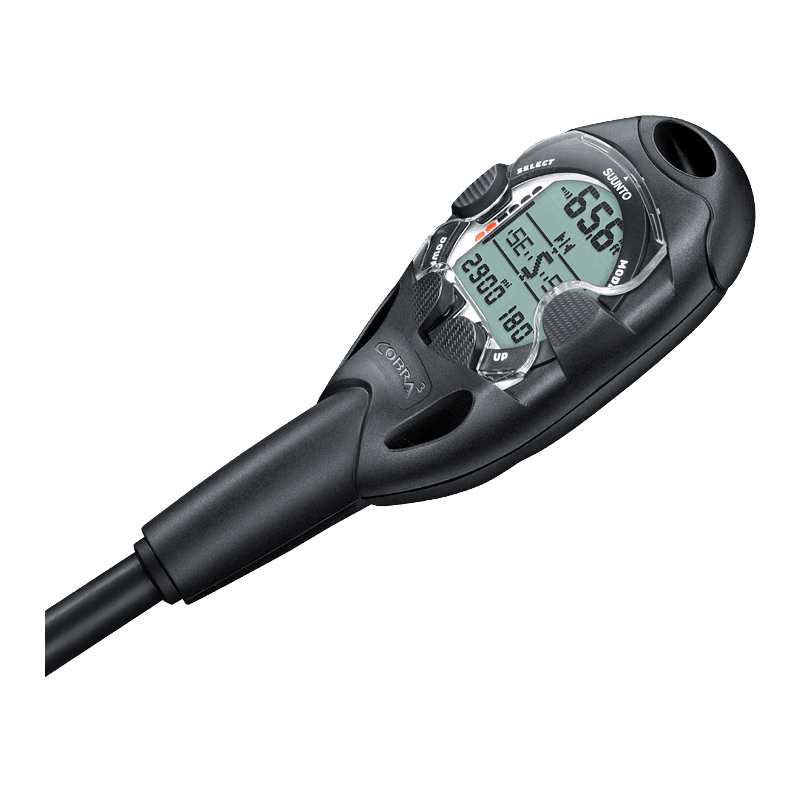 This unique feature allows divers to avoid having redundant equipment like a pressure gauge in case the sensor node fails. The water temperature is displayed in either centigrade or Fahrenheit on the Suunto Cobra 3. There is also a temperature compensated pressure sensor that is calibrated complying with EN 13319. It also offers an integrated 3D tiltable compass. Unfortunately, you do not get a full compass view but instead you'll only see your locked bearing.It needs some time to remember what the graphic represents and it can easily be confused. It might be best to have a scuba diving compass in addition to what is offered through the console. The display is divided into three lines. That's similar to the setup known from the Vyper Novo and Zoop Novo. It's easy to read yet can become a little cluttered with all the data being displayed. The backlight has several timeout options. This is a great feature on the Suunto Cobra 3 because it allows you to preserve the life of your dive battery. The timeout of the backlight ranges from 2 seconds through 60 seconds, giving you plenty of options to suit your needs. The Suunto Cobra 3 has a battery life of 1.5 years. Suunto does not recommend that users replace the battery themselves because of the risk of water leaking into the battery compartment. Keep in mind that the data is not retained when the battery is swapped out because this is not a hot swap featured dive computer. The alarm system consists of both audio and visual alarms. Many low-level alarms are only audio and may consist of short beeps, or interval beeps to alert you to an issue that needs attention. More serious alerts combine audible beeps with activation of the backlight. For life-threatening alerts, you will hear continuous beeps, and the backlight will be activated. These life-threatening alerts can be when the maximum ascent rate of 10 m per second is violated or if the decompression ceiling depth is exceeded. Maximum depth or dive time exceeded, an alarm time reached all get both audio and visual alarms. Nitrox has its own set of alarms to alert you of your maximum safe partial pressure of oxygen levels. The algorithms used on the Suunto Cobra 3 is based on a reduced gradient bubble model. The RGBM predicts gas build-up in the blood and tissues of divers. It is an advancement on the how they used to model gases which did not predict free gas. To optimize the safety in the RGBM algorithm, you must adjust your altitude settings. The Cobra 3 connects to your PC through a USB dongle and is compatible with Movescount, Suunto’s mobile application that functions as a dive log. Movescount functions with the DM4 software allowing you to download your dive data to the mobile app anywhere you are. The biggest missing feature from this dive computer is the functionality of the compass. The very basic waypoint setting and minimal graphic display of 90° or 180° off of your waypoint can be difficult to navigate. Using the compass settings in this dive computer may not be useful for new divers or inexperienced navigators. It would also be nice if there were an option to use this computer as a wrist mount. 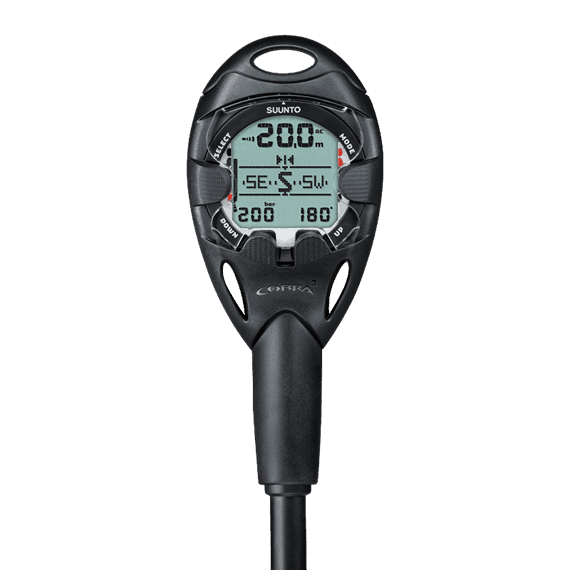 While having it look like a traditional pressure gauge and function similarly allows you to eliminate an additional piece of equipment; not having your data on your wrist can be a hindrance when diving. There’s a lot to like about the Suunto Cobra 3. The battery is user replaceable. Although the manufacturer recommends you take it to a service station. You still can replace the battery yourself. There are instructions for how to do this in the owners manual. The multiple setting backlight display is one of the best features. Many people like to have a long backlight for looking at their diving computer while others prefer a short backlight for quick glimpses of information. Whether you’re trying to preserve your battery life or take a long look at dive information, the Suunto Cobra 3 will have a setting right for you. The three line display makes it easy to read all of the relevant dive information. Some of the information is attempted to be crammed into a fourth line, but it is not that often. The big block view letters are easy to read even for people with slight visual impairments. Unfortunately, the navigation buttons on the Suunto Cobra 3 itself leave a little to be desired. The long and short press navigation options can leave users frustrated when attempting to get to the right screen especially if they're underwater. The lack of an actual compass display is annoying. You do have the ability to set a waypoint marker. The tiny graphics to represent where you need to go are frustrating to read and could leave inexperienced navigators lost. Finally, some people may find that only having a three line display leaves it cluttered. Especially when you’re at your safety stop, and the additional line of information is popped onto that display. Having a fourth line crammed in between your second and third rows is ugly. It can be hard to look at and harder to read. You will usually get the best and lowest price and the best available service through Amazon. Click the button below to find the current pricing and check further customer reviews. The Suunto Cobra 3 has some fantastic reviews on Amazon. Some have called it the best diving computer that they have ever owned. You can read the reviews for yourself by clicking here. Have a look at the following comparison table where we show key features and differences between this scuba computer, the Oceanic Datamax Pro and the Sherwood Vision. Altogether this is a great dive computer. While you pay a little bit more for the design of the Suunto Cobra 3, it is designed like a gauge instead of a wristwatch. It does have all of the features you’ve come to expect from an introductory dive computer. There are plenty of features on this dive computer that will leave everyone satisfied. It looks sleek, and the backlight brightly illuminates all of the data that you need to see. The vital alarms are easily noticed when the backlight begins to flash because of the bright display. Divers who have been diving for a long time may find that this dive computer is a bit rudimentary. Suunto, the Cobra 3 manufacturer, even says that this computer is for a recreational beginner diver and should not be used by professionals or technical divers. It simply does not have enough information to be useful in a technical or professional diving situation. This is especially true considering that the maximum depth is 100 m and the operating temperature is fairly limited. Divers who don’t like having a lot of wires hanging from their BC or their tank are not going to enjoy this computer. Because it is connected to a high-pressure hose on the regulator, you will have additional wires to manage during your dive. Having lots of hoses can lead to an exhausting dive if you’re not used to managing that type of equipment.